For the study of the production of very low temperatures, see Cryogenics. For the low-temperature preservation of living tissue and organisms in general, see Cryopreservation. For the Hot Cross album, see Cryonics (album). Technicians prepare a body for cryopreservation in 1985. Cryonics (from Greek κρύος kryos meaning 'cold') is the low-temperature freezing (usually at −196 °C) of a human corpse, with the hope that resuscitation may be possible in the future. It is regarded with skepticism within the mainstream scientific community and has been characterized as quackery. Cryonics procedures can begin only after clinical death, and cryonics "patients" are legally dead. Cryonics procedures ideally begin within minutes of death, and use cryoprotectants to prevent ice formation during cryopreservation. It is unlikely that a corpse could be reanimated after undergoing vitrification, which causes damage to the brain including its neural networks. The first corpse to be frozen was that of Dr. James Bedford in 1967. As of 2014, about 250 bodies were cryopreserved in the United States, and 1,500 people had made arrangements for cryopreservation after their legal death. Cryonic proponents go further than the mainstream consensus in saying that the brain does not have to be continuously active to survive or retain memory. Cryonics controversially states that a human survives even within an inactive brain that has been badly damaged, provided that original encoding of memory and personality can, in theory, be adequately inferred and reconstituted from structure that remains. Cryonicists argue that as long as brain structure remains intact, there is no fundamental barrier, given our current understanding of physical law, to recovering its information content. The cryonics' argument that death does not occur as long as brain structure remains intact and theoretically repairable has received some mainstream medical discussion in the context of the ethical concept of brain death and organ donation. Cryonics uses temperatures below −130 °C, called cryopreservation, in an attempt to preserve enough brain information to permit future revival of the cryopreserved person. Cryopreservation may be accomplished by freezing, freezing with cryoprotectant to reduce ice damage, or by vitrification to avoid ice damage. Even using the best methods, cryopreservation of whole bodies or brains is very damaging and irreversible with current technology. Cryonics requires future technology to repair or regenerate tissue that is diseased, damaged, or missing. Brain repairs in particular will require analysis at the molecular level. This far-future technology is usually assumed to be nanomedicine based on molecular nanotechnology. Biological repair methods or mind uploading have also been proposed. Costs can include payment for medical personnel to be on call for death, vitrification, transportation in dry ice to a preservation facility, and payment into a trust fund intended to cover indefinite storage in liquid nitrogen and future revival costs. As of 2011, U.S. cryopreservation costs can range from $28,000 to $200,000, and are often financed via life insurance. KrioRus, which stores bodies communally in large dewars, charges $12,000 to $36,000 for the procedure. Some patients opt to have only their brain cryopreserved, rather than their whole body. As of 2014, about 250 corpses have been cryogenically preserved in the U.S., and around 1,500 people have signed up to have their remains preserved. As of 2016, four facilities exist in the world to retain cryopreserved bodies: three in the U.S. and one in Russia. Long-term preservation of biological tissue can be achieved by cooling to temperatures below −130 °C. Immersion in liquid nitrogen at a temperature of −196 °C (77 kelvins and −320.8 °F) is often used for convenience. Low temperature preservation of tissue is called cryopreservation. Contrary to popular belief, water that freezes during cryopreservation is usually water outside cells, not water inside cells. Cells don't burst during freezing, but instead become dehydrated and compressed between ice crystals that surround them. Intracellular ice formation occurs only if the rate of freezing is faster than the rate of osmotic loss of water to the extracellular space. Without cryoprotectants, cell shrinkage and high salt concentrations during freezing usually prevent frozen cells from functioning again after thawing. In tissues and organs, ice crystals can also disrupt connections between cells that are necessary for organs to function. The difficulties of recovering large animals and their individual organs from a frozen state have been long known. Attempts to recover frozen mammals by simply rewarming them were abandoned by 1957. At present, only cells, tissues, and some small organs can be reversibly cryopreserved. When used at high concentrations, cryoprotectants can stop ice formation completely. Cooling and solidification without crystal formation is called vitrification. 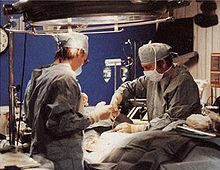 The first cryoprotectant solutions able to vitrify at very slow cooling rates while still being compatible with whole organ survival were developed in the late 1990s by cryobiologists Gregory Fahy and Brian Wowk for the purpose of banking transplantable organs. This has allowed animal brains to be vitrified, warmed back up, and examined for ice damage using light and electron microscopy. No ice crystal damage was found; remaining cellular damage was due to dehydration and toxicity of the cryoprotectant solutions. Large vitrified organs tend to develop fractures during cooling, a problem worsened by the large tissue masses and very low temperatures of cryonics. The use of vitrification rather than freezing for cryonics was anticipated in 1986, when K. Eric Drexler proposed a technique called fixation and vitrification, anticipating reversal by molecular nanotechnology. In 2016, Robert L. McIntyre and Gregory Fahy at the cryobiology research company 21st Century Medicine, Inc. won the Small Animal Brain Preservation Prize of the Brain Preservation Foundation by demonstrating to the satisfaction of neuroscientist judges that a particular implementation of fixation and vitrification called aldehyde-stabilized cryopreservation could preserve a rabbit brain in "near perfect" condition at −135 °C, with the cell membranes, synapses, and intracellular structures intact in electron micrographs. Brain Preservation Foundation President, Ken Hayworth, said, "This result directly answers a main skeptical and scientific criticism against cryonics—that it does not provably preserve the delicate synaptic circuitry of the brain.” However the price paid for perfect preservation as seen by microscopy was tying up all protein molecules with chemical crosslinks, completely eliminating biological viability. Actual cryonics organizations use vitrification without a chemical fixation step, sacrificing some structural preservation quality for less damage at the molecular level. Some scientists, like Joao Pedro Magalhaes, have questioned whether using a deadly chemical for fixation eliminates the possibility of biological revival, making chemical fixation unsuitable for cryonics. While preservation of both structure and function has been possible for brain slices using vitrification, this goal remains elusive for whole brains. In absence of a revived brain, or brain simulation from somehow scanning a preserved brain, the adequacy of present vitrification technology (with or without fixation) for preserving the anatomical and molecular basis of long-term memory as required by cryonics is still unproven. Outside the cryonics community, many scientists have a blanket skepticism toward existing preservation methods. Cryobiologist Dayong Gao states that "we simply don't know if (subjects have) been damaged to the point where they've 'died' during vitrification because the subjects are now inside liquid nitrogen canisters." Biochemist Ken Storey argues (based on experience with organ transplants), that "even if you only wanted to preserve the brain, it has dozens of different areas, which would need to be cryopreserved using different protocols." Those who believe that revival may someday be possible generally look toward advanced bioengineering, molecular nanotechnology, or nanomedicine as key technologies. Revival would require repairing damage from lack of oxygen, cryoprotectant toxicity, thermal stress (fracturing), freezing in tissues that do not successfully vitrify, and reversing the cause of death. In many cases extensive tissue regeneration would be necessary. According to Cryonics Institute president Ben Best, cryonics revival may be similar to a last in, first out process. People cryopreserved in the future, with better technology, may require less advanced technology to be revived because they will have been cryopreserved with better technology that caused less damage to tissue. In this view, preservation methods would get progressively better until eventually they are demonstrably reversible, after which medicine would begin to reach back and revive people cryopreserved by more primitive methods. Historically, a person had little control regarding how their body was treated after death as religion had jurisdiction over the disposal of the body. However, secular courts began to exercise jurisdiction over the body and use discretion in carrying out of the wishes of the deceased person. Most countries legally treat preserved individuals as deceased persons because of laws that forbid vitrifying someone who is medically alive. In France, cryonics is not considered a legal mode of body disposal; only burial, cremation, and formal donation to science are allowed. However, bodies may legally be shipped to other countries for cryonic freezing. As of 2015, the Canadian province of British Columbia prohibits the sale of arrangements for body preservation based on cryonics. In Russia, cryonics falls outside both the medical industry and the funeral services industry, making it easier in Russia than in the U.S. to get hospitals and morgues to release cryonics candidates. In London in 2016, the English High Court ruled in favor of a mother's right to seek cryopreservation of her terminally ill 14-year-old daughter, as the girl wanted, contrary to the father's wishes. The decision was made on the basis that the case represented a conventional dispute over the disposal of the girl's body, although the judge urged ministers to seek "proper regulation" for the future of cryonic preservation following concerns raised by the hospital about the competence and professionalism of the team that conducted the preservation procedures. In Alcor Life Extension Foundation v. Richardson, the Iowa Court of Appeals ordered for the disinterment of Richardson, who was buried against his wishes for cryopreservation. A detailed legal examination by Jochen Taupitz concludes that cryonic storage is legal in Germany for an indefinite period of time. In 2009, writing in Bioethics, David Shaw examines the ethical status of cryonics. The arguments against it include changing the concept of death, the expense of preservation and revival, lack of scientific advancement to permit revival, temptation to use premature euthanasia, and failure due to catastrophe. Arguments in favor of cryonics include the potential benefit to society, the prospect of immortality, and the benefits associated with avoiding death. Shaw explores the expense and the potential payoff, and applies an adapted version of Pascal's Wager to the question. In 2016, Charles Tandy wrote in favor of cryonics, arguing that honoring someone's last wishes is seen as a benevolent duty in American and many other cultures. Cryopreservation was applied to human cells beginning in 1954 with frozen sperm, which was thawed and used to inseminate three women. Eight years later, the freezing of humans was first scientifically proposed by Michigan professor Robert Ettinger when he wrote The Prospect of Immortality. Later he went on to found the Cryonics Institute where he is cryopreserved today. In April 1966, the first human body was frozen, though it had been embalmed for two months. It was placed in liquid nitrogen and stored at just above freezing. The middle-aged woman from Los Angeles, whose name is unknown, was soon thawed out and buried by relatives. The first body to be frozen with the hope of future revival was James Bedford's, a few hours after his cancer-caused death in 1967. He is the only cryonics patient frozen before 1974 still preserved today. Cryonics gained a poor reputation in the U.S. in the late 1970s after the Cryonics Society of California ran out of money to maintain cryopreservation of existing patients. Robert Nelson, a former TV repairman with no scientific background (who had processed Bedford's freezing before turning the body over to relatives), was sued for allowing nine bodies to decompose. In 2018, a Y-Combinator startup called Nectome was recognized for developing a method of preserving brains with chemicals rather than by freezing. The method is fatal, performed as euthanasia under general anethesia, but the hope is that future technology would allow the brain to be physically scanned into a computer simulation, neuron by neuron. According to The New York Times, cryonicists are predominantly nonreligious white males, outnumbering women by about three to one. According to The Guardian, as of 2008, while most cryonicists used to be young, male and "geeky" recent demographics have shifted slightly towards whole families. In 2015 Du Hong, a 61-year-old female writer of children's literature, became the first known Chinese national to be cryopreserved. Scientists have expressed skepticism about cryonics in media sources, however the number of peer-reviewed papers on cryonics is limited because its speculative aspects place it outside of the focus of most academic fields. While some neuroscientists contend that all the subtleties of a human mind are contained in its anatomical structure, few neuroscientists will comment directly upon the topic of cryonics due to its speculative nature. Individuals who intend to be frozen are often "looked at as a bunch of kooks". William T. Jarvis has written that "Cryonics might be a suitable subject for scientific research, but marketing an unproven method to the public is quackery". According to cryonicist Aschwin de Wolf and others, cryonics can often produce intense hostility from spouses who are not cryonicists. James Hughes, the executive director of the pro-life-extension Institute for Ethics and Emerging Technologies, chooses not to personally sign up for cryonics, calling it a worthy experiment but stating laconically that "I value my relationship with my wife." Cryobiologist Dayong Gao states that "People can always have hope that things will change in the future, but there is no scientific foundation supporting cryonics at this time." Alcor disagrees, stating that "There are no known credible technical arguments that lead one to conclude that cryonics, carried out under good conditions today, would not work." As well, while it is universally agreed that "personal identity" is uninterrupted when brain activity temporarily ceases during incidents of accidental drowning (where people have been restored to normal functioning after being completely submerged in cold water for up to 66 minutes), some people express concern that a centuries-long cryopreservation might interrupt their conception of personal identity, such that the revived person would "not be you". Many people say there would be no point in being revived in the far future if their friends and families are dead. Suspended animation is a popular subject in science fiction and fantasy settings, appearing in comic books, films, literature, and television. A survey in Germany found that about half of the respondents were familiar with cryonics, and about half of those familiar with cryonics had learned of the subject from films or television. Some commonly known examples of cryonics being used in popular culture include Demolition Man (film), Vanilla Sky, Fallout 3, Fallout 4, Futurama, Halo, Passengers, Nip/Tuck and "The Neutral Zone" (Star Trek: The Next Generation), "The 37s" (Star Trek Voyager). Among the cryopreserved are L. Stephen Coles (in 2014), Hal Finney (in 2014), and Ted Williams. The urban legend suggesting Walt Disney was cryopreserved is false; he was cremated and interred at Forest Lawn Memorial Park Cemetery. [a] Robert A. Heinlein, who wrote enthusiastically of the concept in The Door into Summer (serialized in 1956), was cremated and had his ashes distributed over the Pacific Ocean. Timothy Leary was a long-time cryonics advocate and signed up with a major cryonics provider, but he changed his mind shortly before his death, and was not cryopreserved. ^ Robert Nelson told the Los Angeles Times that he thought Walt Disney wanted to be cryopreserved as Walt Disney Studios had called him to ask detailed questions about his organisation, the Cryonics Society of California. However, Nelson clarified that "They had him cremated. I personally have seen his ashes." ^ McKie, Robin (13 July 2002). "Cold facts about cryonics". The Observer. Retrieved 1 December 2013. Cryonics, which began in the Sixties, is the freezing – usually in liquid nitrogen – of human beings who have been legally declared dead. The aim of this process is to keep such individuals in a state of refrigerated limbo so that it may become possible in the future to resuscitate them, cure them of the condition that killed them, and then restore them to functioning life in an era when medical science has triumphed over the activities of the Grim Reaper. ^ a b "Dying is the last thing anyone wants to do – so keep cool and carry on". The Guardian. 10 October 2015. Retrieved 21 February 2016. ^ a b Butler K (1992). A Consumer's Guide to "Alternative" Medicine. Prometheus Books. p. 173. ^ Hendry, Robert; Crippen, David (2014). "Brian Failure and Brain Death". ACS Surgery: Principles and Practice critical care. Decker Intellectual Properties Inc. pp. 1–10. A physician will pronounce a patient using the usual cardiorespiratory criteria, whereupon the patient is legally dead. Following this pronouncement, the rules pertaining to procedures that can be performed change radically because the individual is no longer a living patient but a corpse. In the initial cryopreservation protocol, the subject is intubated and mechanically ventilated, and a highly efficient mechanical cardiopulmonary resuscitation device reestablishes circulation. ^ Best BP (April 2008). "Scientific justification of cryonics practice" (PDF). Rejuvenation Research. 11 (2): 493–503. doi:10.1089/rej.2008.0661. PMC 4733321. PMID 18321197. ^ Devlin, Hannah (18 November 2016). "The cryonics dilemma: will deep-frozen bodies be fit for new life?". The Guardian. Retrieved 21 January 2019. ^ "Death To Dust: What Happens To Dead Bodies? 2nd Edition, Chapter 7: Souls On Ice". ^ a b c d e Moen, OM (August 2015). "The case for cryonics". Journal of Medical Ethics. 41 (18): 493–503. doi:10.1136/medethics-2015-102715. PMID 25717141. ^ Doyle, DJ (2012). "Cryonic Life Extension: Scientific Possibility or Stupid Pipe Dream?". Ethics in Biology, Engineering and Medicine: An International Journal. 3 (1–3): 9–28. doi:10.1615/EthicsBiologyEngMed.2013006985. ^ Whetstine, L; Streat, S; Darwin, M; Crippen, D (2005). "Pro/con ethics debate: When is dead really dead?". Critical Care. 9 (6): 538–542. doi:10.1186/cc3894. PMC 1414041. PMID 16356234. The brain is a discrete pattern of atoms, each as effective as the next as long as the unique pattern of their arrangement persists. Presumably all of the attributes of personhood are encoded in this lattice. This view allows us to view the person as 'information beings', defined by the arrangement of particular atoms that comprise our brains at any moment. So long as that pattern of information can be recovered, the person is not dead. ^ Crippen, DW; Whetstine, L (2007). "Ethics review: Dark angels – the problem of death in intensive care". Critical Care. 11 (1): 202. doi:10.1186/cc5138. PMC 2151911. PMID 17254317. One caucus says that death is irreversible when the patient cannot "spontaneously" resuscitate. But how long does one have to wait to be sure that auto-resuscitation will not occur? Long enough for death of a quorum of cells? Another caucus says that death is irreversible when the patient cannot be resuscitated by any means or when resuscitation fails. Does this mean that every dying patient must be assaulted by every possible intervention if he or she is to be proven dead? A third caucus says that irreversibility occurs when the inherent order of the atoms that make up the brain are irrevocably destroyed. If the atomic structure of the brain is disturbed but the structural integrity of the brain is maintained, there is no fundamental barrier, given our current understanding of physical law, to recovering its information content, however labor-intensive that might be. ^ Drexler, K. Eric (September 1981). "Molecular engineering: An approach to the development of general capabilities for molecular manipulation". Proc Natl Acad Sci U S A. 78 (9): 5275–5278. Bibcode:1981PNAS...78.5275D. doi:10.1073/pnas.78.9.5275. PMC 348724. PMID 16593078. ^ Drexler, Eric (1986). "Chapter 9: A Door to the Future". Engines of Creation. Anchor Press/Doubleday. pp. 130–146. ISBN 978-0-385-19972-8. ^ Freitas Jr., Robert A. (1999). "1.3.2.1 The Biological Tradition". Nanomedicine, Volume I: Basic Capabilities. Landes Bioscience. ISBN 978-1-57059-680-3. ^ "Frozen in time: Oregon firm preserves bodies, brains in hopes that science catches up". Portland Tribune. 18 February 2016. Retrieved 21 February 2016. ^ a b c "Cryonics: the chilling facts". The Independent. 26 July 2011. Retrieved 21 February 2016. ^ "A Dying Young Woman's Hope in Cryonics and a Future". The New York Times. 12 September 2015. Retrieved 21 February 2016. ^ a b c d "Inside the weird world of cryonics". Financial Times. 18 December 2015. Retrieved 21 February 2016. ^ "'The ultimate lottery ticket:' Inside one of four cryonics facilities in the world". KOIN (CBS Portland). 18 February 2016. Retrieved 21 February 2016. ^ a b Mazur P (September 1984). "Freezing of living cells: mechanisms and implications". The American Journal of Physiology. 247 (3 Pt 1): C125–42. doi:10.1152/ajpcell.1984.247.3.C125. PMID 6383068. ^ Fahy GM, Levy DI, Ali SE (June 1987). "Some Emerging Principles Underlying the Physical Properties, Biological Actions, and Utility of Vitrification Solutions". Cryobiology. 24 (3): 196–213. doi:10.1016/0011-2240(87)90023-X. PMID 3595164. ^ Smith Audrey U (1957). "Problems in the Resuscitation of Mammals from Body Temperatures Below 0 degrees C". Proceedings of the Royal Society of London. Series B, Biological Sciences. 147 (929): 533–44. Bibcode:1957RSPSB.147..533S. doi:10.1098/rspb.1957.0077. JSTOR 83173. ^ Fahy GM, Wowk B, Wu J (2006). "Cryopreservation of complex systems: the missing link in the regenerative medicine supply chain" (PDF). Rejuvenation Research. 9 (2): 279–91. CiteSeerX 10.1.1.539.7419. doi:10.1089/rej.2006.9.279. PMID 16706656. ^ a b Fahy GM, Wowk B, Pagotan R, et al. (July 2009). "Physical and biological aspects of renal vitrification". Organogenesis. 5 (3): 167–75. doi:10.4161/org.5.3.9974. PMC 2781097. PMID 20046680. ^ Fahy GM, MacFarlane DR, Angell CA, Meryman HT (August 1984). "Vitrification as an approach to cryopreservation". Cryobiology. 21 (4): 407–26. doi:10.1016/0011-2240(84)90079-8. PMID 6467964. ^ Fahy GM, Wowk B, Wu J, et al. (April 2004). "Cryopreservation of organs by vitrification: perspectives and recent advances". Cryobiology. 48 (2): 157–78. doi:10.1016/j.cryobiol.2004.02.002. PMID 15094092. ^ Fahy, G; Wowk, B; Wu, J; Phan, J; Rasch, C; Chang, A; Zendejas, E (2005). "Corrigendum to "Cryopreservation of organs by vitrification: perspectives and recent advances" [Cryobiology 48 (2004) 157–178]". Cryobiology. 50 (3): 344. doi:10.1016/j.cryobiol.2005.03.002. ^ Lemler J, Harris SB, Platt C, Huffman TM (June 2004). "The arrest of biological time as a bridge to engineered negligible senescence". Annals of the New York Academy of Sciences. 1019 (1): 559–63. Bibcode:2004NYASA1019..559L. doi:10.1196/annals.1297.104. PMID 15247086. ^ Fahy GM, Saur J, Williams RJ (October 1990). "Physical problems with the vitrification of large biological systems". Cryobiology. 27 (5): 492–510. doi:10.1016/0011-2240(90)90038-6. PMID 2249453. ^ Wowk B (2011). "Systems for Intermediate Temperature Storage for Fracture Reduction and Avoidance". Cryonics. Vol. 2011 no. 3. Alcor Life Extension Foundation. pp. 7–13. ISSN 1054-4305. ^ McIntyre RL, Fahy GM (December 2015). "Aldehyde-stabilized cryopreservation". Cryobiology. 71 (3): 448–458. doi:10.1016/j.cryobiol.2015.09.003. PMID 26408851. ^ "Small Mammal BPF Prize Winning Announcement". Brain Preservation Foundation. 2016-02-09. Retrieved 2016-03-20. ^ Claire Maldarelli (9 February 2016). "Researchers Have Preserved an Entire Rabbit Brain". Popular Science. Retrieved 20 March 2016. ^ Michael Shermer (1 February 2016). "Can Our Minds Live Forever?". Scientific American. Retrieved 20 March 2016. ^ Anthony Cuthbertson (10 February 2016). "Rabbit Brain Returns Successfully from Cryopreservation". Newsweek. Retrieved 21 February 2016. ^ "Alcor Position Statement on Brain Preservation Prize". Alcor Life Extension Foundation. 2016-02-12. Retrieved 2016-03-20. ^ "Mammal brain frozen and thawed out perfectly for first time". New Scientist. Retrieved 2016-06-06. ^ Pichugin Y, Fahy GM, Morin R (April 2006). "Cryopreservation of rat hippocampal slices by vitrification". Cryobiology. 52 (2): 228–240. doi:10.1016/j.cryobiol.2005.11.006. PMID 16403489. ^ a b "Frozen body: Can we return from the dead?". BBC News. 15 August 2013. Retrieved 21 February 2016. ^ Karow, Armand; Webb, Watts (1965). "Tissue Freezing: A theory for injury and survival". Crybiology. 2 (3): 99–108. doi:10.1016/s0011-2240(65)80094-3. ^ a b c "Patients who are frozen in time". The Guardian. 13 February 2008. Retrieved 21 February 2016. ^ a b c Dukeminier, Jesse; Sitkoff, Robert (2013). Wills, Trusts, and Estates. Wolters Kluwer Law & Business in New York. p. 507. ISBN 978-1-4548-2457-2. ^ Chrisafis, Angelique (16 March 2006). "Freezer failure ends couple's hopes of life after death". The Guardian. Retrieved 8 January 2014. ^ Proctor, Jason (16 July 2015). "Immortality sought through B.C. Supreme Court lawsuit". CBC News. Retrieved 21 February 2016. ^ "Terminally ill teen won historic ruling to preserve body". BBC News. November 18, 2016. Retrieved November 18, 2016. ^ "Alcor Life Extension Foundation v. Richardson". 785 N.W.2d 717. 2010. ^ Taupitz, Jochen; Fuhr, Günther; Zwick, Anna; Salkic, Amina (2013). Unterbrochenes Leben?. St. Ingbert, Germany: Fraunhofer Verlag. ISBN 978-3-8396-0593-6. ^ Tandy, Charles (8 Feb 2017). "An Open Letter to Physicians in Death-with-Dignity States (The Case of a Terminally Ill Cryonicist)". Social Science Research Network. ^ "Fatherhood After Death Has Now Been Proved Possible". Cedar Rapids Gazette. April 9, 1954. ^ Devlin, Hannah (18 November 2016). "The cryonics dilemma: will deep-frozen bodies be fit for new life?". The Guardian. Retrieved 22 September 2018. ^ a b Perry, R. Michael (October 2014). "Suspension Failures – Lessons from the Early Days". ALCOR: Life Extension Foundation. Retrieved August 29, 2018. ^ "Dear Dr. Bedford (and those who will care for you after I do)". Cryonics. July 1991. Retrieved 2009-08-23. ^ "A startup is pitching a mind-uploading service that is "100 percent fatal"". Technology Review. 13 March 2018. ^ a b Howley, Kerry (7 July 2010). "Until Cryonics Do Us Part". The New York Times Magazine. Retrieved 2 February 2016. ^ Stephen Chen (2015-09-18). "Cheating death? Elderly writer is the first known Chinese to embrace cryogenics, her head now frozen by lab in Arizona | South China Morning Post". Scmp.com. Retrieved 2015-09-24. ^ Jerry Adler (May 2015). "The Quest to Upload Your Mind Into the Digital Space". Smithsonian Magazine. Retrieved 21 February 2016. ^ "Brain Freeze: Can putting faith in cryonics deliver life after death?". Toronto Sun. 6 October 2015. Retrieved 21 February 2016. ^ "The Cryonics Society: Cryonics And Adventure". www.cryonicssociety.org. Retrieved 2016-03-28. ^ Los Angeles Times (4 December 2014). "L. Stephen Coles dies at 73; studied extreme aging in humans". latimes.com. ^ "Bitcoin's Earliest Adopter Is Cryonically Freezing His Body to See the Future – WIRED". WIRED. 2014-08-29. ^ "Leukemia claims son of Hall of Famer". ESPN.com. 2004-03-07. ^ Mikkelson, David (19 October 1995). "FACT CHECK: Was Walt Disney Frozen?". Snopes. Retrieved 21 January 2019. ^ Conradt, Stacy (15 December 2013). "Disney on Ice: The Truth About Walt Disney and Cryogenics". Mental Floss. Retrieved 21 January 2019. Wikimedia Commons has media related to Cryonics.